Join the Child and Youth Care Association of BC for a special ‘Brown Bag Lunch & Learn’ on Friday February 17th. Sue Hunt, BA CYC will share her experience and learning from a recent research project and indepth service review of a local Provincial Organzation. 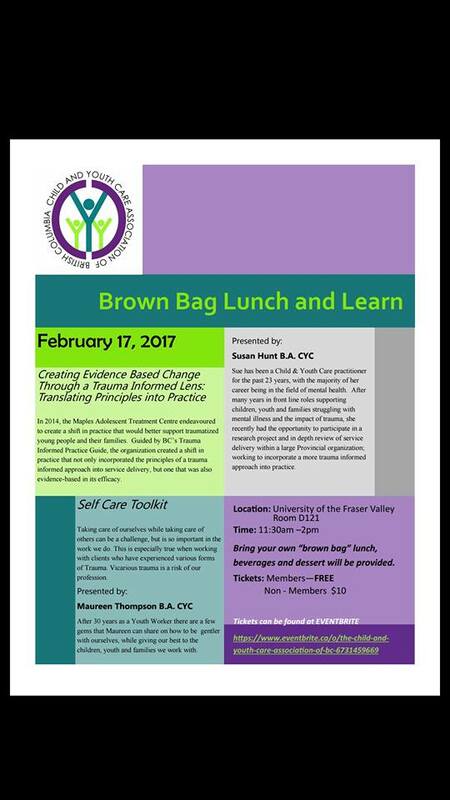 Experienced CYC Practitioner Maureen Thompson, BA CYC will share some wisdom about how to take care of ourselves so we can take care of others. Recent events in her workplace highlighted the importance of this for herself and colleagues.